Movies have made leaps in this field since the late 1990s, and this video demonstration made by Lucasfilm is yet another clue to the future of filmmaking. Reportedly, ILM have reopened their model unit for J. J. Abram’s forthcoming Star Wars Episode VII, but James Cameron’s Avatar projects and Peter Jackson’s ongoing quest with the Hobbit movies makes it necessary for Lucasfilm and their effects and animation branches to keep up. It’s ironic that Lucasfilm and Disney’s new Star Wars trilogy will be filmed in 2D on Kodak 35 mm. Well, as a fan I’m happy that I won’t risk seeing it in 3D. 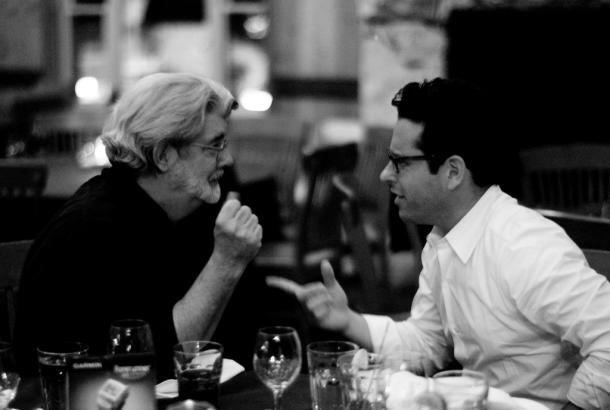 George Lucas and J. J. Abrams: Master and apprentice?